Stadium tours are only available at limited times so you need to plan your visit with a tour time. There is only one type of tour available which is a stadium and museum tour. 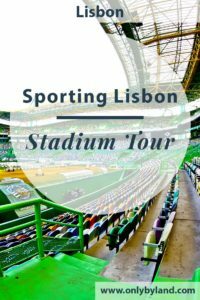 The Sporting Lisbon stadium tour is presented first in Portuguese, then in English. The Jose Alvadade stadium is conveniently located next to the metro station, Campo Grande. I traveled by metro from the 1908 Lisboa hotel direct from Intendente station. The metro journey from historic Lisbon takes about 15 minutes. You buy your tickets close to the museum entrance (above) not from the club shop. For those visiting as a family, there is a good value family ticket available. The club shop is at the other side of the stadium. You’ll get to see the stadium from 2 different vantage points. You will see it from pitch side by the dugouts. I found the best vantage point was from the presidential seats which makes sense! The stadium is famous for its multicolored seats. It’s a 5 star stadium and has hosted some important matches. Famous matches played here include the semi final of Euro 2004 and the final of the 2005 UEFA Cup. Portugal were represented in both of these fixtures. In the Euro 2004 semi final Portugal beat The Netherlands 2-1. Sporting Lisbon made it to the final of the UEFA Cup in 2005 but lost in their home stadium to CSKA Moscow 3-1. The stadium capacity is just over 50,000. The presidents suite has a lion in it. 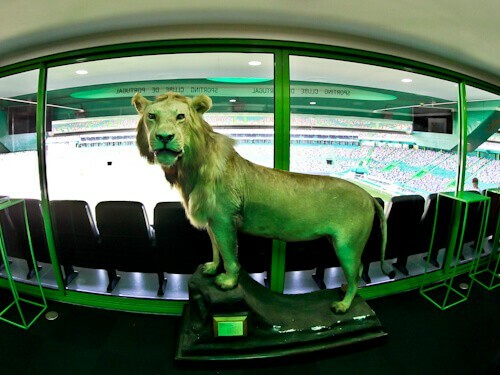 This is because the nickname of Sporting Lisbon is ‘The Lions’. On the club emblem there is a lion. You are welcome to take selfies and Instagram shots with the lion, it does not bite. Once you have safely passed the lion you may sit in the presidents seat which has the best vantage point of the stadium. 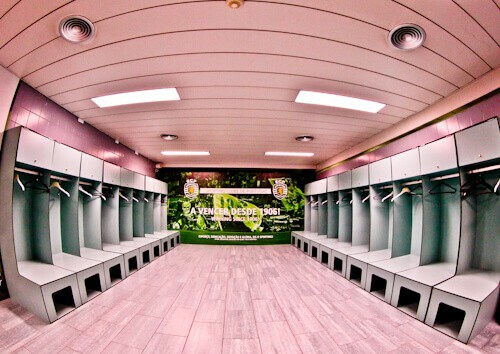 The away team dressing room is basic but decent enough for the away team. There are basic facilities and lockers. It says on the wall ‘A vencer desde 1906’. This translates to ‘winning since 1906’. 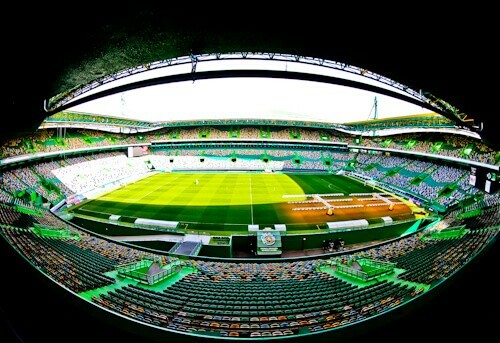 The away team will always be aware they are playing in the home of Sporting Lisbon. You cannot enter the Sporting Lisbon dressing room. Like their neighbors Benfica at the Estadio da Luz, the home team dressing rooms remain a mystery. What could it be like to give them such a psychological advantage? 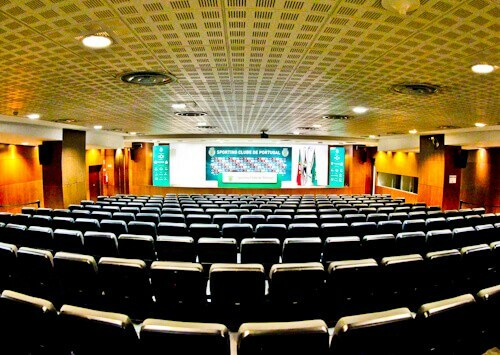 The Sporting Lisbon press room is huge. This will be full for press conferences about the Champions or Europa League. You may go sit where the manager sits during the team press conferences. This area is perfect for taking your Instagram or Facebook photos. The most famous moment in Sporting Lisbon history was when they won the old version of the Europa League. In 1964 they beat Manchester United 5-0 on there way to winning the trophy. They beat Budapest in the final after a replay. Two notable Portuguese legends who have played for Sporting Lisbon are Luis Figo and Cristiano Ronaldo. You’ll learn all about historic players and matches in the museum. 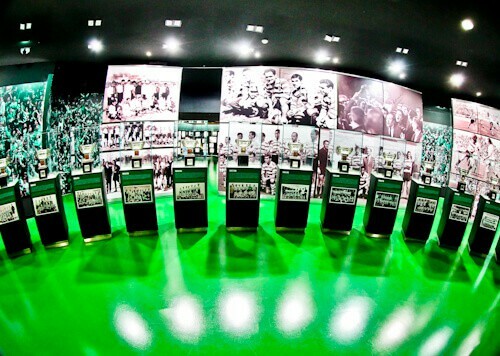 Sporting Lisbon has a very impressive trophy cabinet. Not only will you see football trophies but you also see trophies from other sports. Sporting Lisbon are represented in other sports. Other sports they play are combat sports, futsal, handball, archery and triathlon. 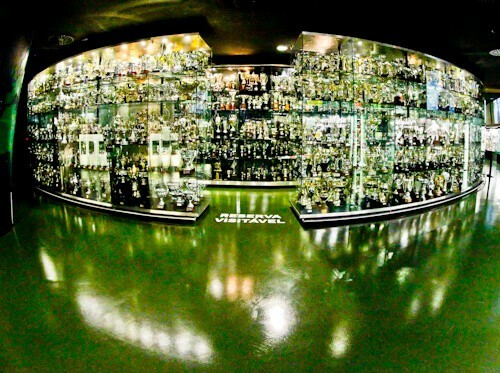 You can take quite a nice reflection shot of the Sporting Lisbon trophy cabinet. If you feel the need to buy some Sporting Lisbon merchandise you may check out the club shop. There is a huge Cristiano Ronaldo picture you can take your photo with in there too. He is looking a lot younger in this poster as it was taken during his days at Sporting Lisbon. Make sure you ask the guide all the questions you have about the club and stadium. The guide will happily take your photo anywhere you like. Good places for photos are with the lion, in the press room and of course from the stadium. 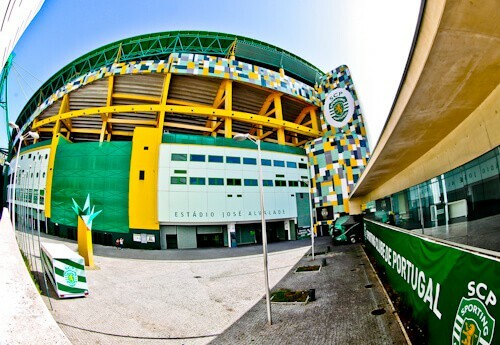 If you are lucky, Sporting Lisbon will be playing when you’re in Lisbon. Check the fixture list for details. What to see in Lisbon and Sintra. Why not visit the rival team on a Benfica Stadium Tour. I knew Sporting Lisbon had a nice stadium but didn’t know it was so big! The colored seats are a unique touch, as is the lion in the presidents box! I’d love to take a stadium tour, or even better watch a live game! Am not a football fan myself but as a building this is amazing! Loved Lisbon on our cruise this summer so tweeted this to my followers in case someone’s going to be in Lisbon needing an interesting excursion. I have seen the Sporting Lisbon stadium on TV, those colourful seats are so unique! I think in Lisbon I would take both the Benfica stadium and Sporting Lisbon stadium tours. Each stadium has its own unique advantage! It must have been amazing when Cristiano Ronaldo was playing here. Wow! That stadium is huge! I love tours like this where you can get a “behind the scenes” look. I like the idea behind keeping the home team’s dressing room a mystery. Makes me want to see it even more! I was lucky enough to go to a Benfica game in Lisbon a couple of months ago because Sporting weren’t playing while I was there. Stadium looks great and sounds like a fun tour to take while in the city! I bet you could feel the roar of the crowds even when the stadium was completely empty 🙂 Imagine the excitement when a game is on! We missed a trip to this place while in Lisbon. Were you staying in the vicinity? It would be nice to tour futbol stadiums more often. I personally feel they are more iconic than American football. It is pretty neat that you are able to sit in the presidents seats on the tour. It seems like a great tour especially since you can see great areas like locker rooms and the press room. I had no idea that SCP also competed in other sports. How interesting you can take a tour of the stadium. I’m not one for football (soccer) but I’d definitely make a trip here if I was in Portugal. I’ve been to Madison Square Garden in NYC, this seems so much bigger. I’ve been to the Sporting Lisbon stadium twice following my Scottish team. The stadium was good (and we won!) but I missed out on the tour. A stadium tour would’ve been pretty cool! This is the first blog post I’m reading about a stadium. I’m a football fan and I’m glad that I found your blog post. We normally see the GAME, but you showed us what is behind this exciting game. Thanks for sharing and keep up the good work. That’s a pretty huge and impressive stadium and I’d be definitely including it in my Lisbon itinerary. Watching a live game here would be so much fun, knowing that Cristiano Ronaldo has played here before. Would love to take a tour one day.